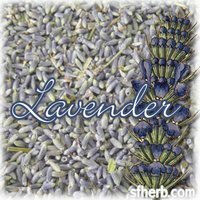 Bulk Dried Lavender | San Francisco Herb Co.
Fragrance your home with our wholesale lavender products! Whether you’re looking for essential oil, lavender buds or bulk dried lavender, SF Herb has the right solution for you. Blue-purple in color, our No. 1 grade lavender is a great option for potpourri, bath herbs, and culinary cooking. For a stronger, piney scent, try our No. 2 grade lavender, which is grey-purple in color but is perfect for sachets, pillows, and bath herbs. As essential oil suppliers, we strive to provide quality products at a great value. Explore our selection of bulk lavender buds, essential oils and more! What are the differences among the different grades of bulk lavender? 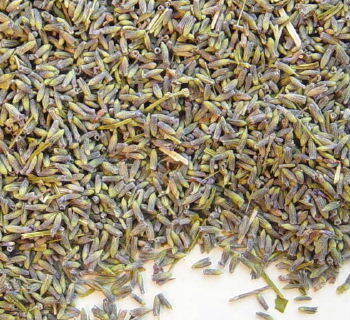 Our bulk dried lavender is graded primarily by color and application. Our #2 lavender is a greyish-blue color with a strong and bright lavender scent. It is preferred for sachets, pillows, soaps, and other uses where the fragrance is desired above color. This bulk dried lavender is actually lavandin (Lavandula x intermedia), which is a cross of English lavender and spike lavender. Our #1 lavender is a medium-blue color, with a more subtle floral lavender fragrance. It is best utilized for culinary dishes (particularly savory ones) and in display potpourri and crafts. This bulk dried lavender is sourced from English lavender (Lavandula angustifolia) grown in France. Not often available due to steep price, Ultra lavender is the darkest grade we have offered with a deep blue color and a sweeter, almost fruity lavender scent. It is ideal for culinary use — particularly for desserts, teas, and lavender sugars. 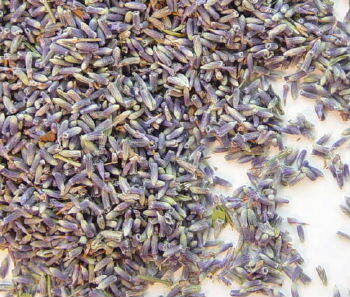 This particular grade of bulk lavender buds also makes a great background color for herb crafts.